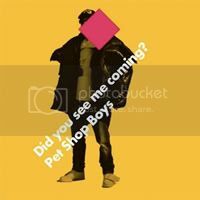 PET SHOP BOYS | Did You See Me Coming? You don't have be in "Who's Who"
Just "to thyself be true"
Keyboards & programming: Chris Lowe, Neil Tennant, Pete Gleadall, Tim Powell, Nick Coler, Brian Higgins. Guitars: Johnny Marr, Owen Parker, Nick Coler. x "Did You See Me Coming?" is be the second single from Yes, to be released on 1st June. x It was the first song that the Pet Shop Boys played to Brian Higgins after meeting him. Chris Lowe told Planet Sound: "We had to play them a new song. We chose Did You See Me Coming, and Brian said 'Oh, that's 80% there.' The other 20% was it needed more welly." x Neil Tennant: "My mother used to say: 'They must have seen you coming,' and it meant you were being hoodwinked or something. It's about a guy realising that the girl has seen him across the crowded room and realised that he's just going to fall in love with her immediately. It's a bit Cole Porter. It was actually the first song we wrote for this album and we realised then that the direction was going very poppy with very chirpy, happy harmonies." x For their most recent record, Yes, the duo drafted in Girls Aloud producers Xenomania to help them craft an all-out upbeat pop record. 'Did You See Me Coming? ', the album's second single, is a neat illustration of its sound.